Many of us naively assume that telepathic powers are the stuff of fiction, not fact. Yet every day we all beam our thoughts and feelings into the heads of other people, and we presage impending danger or opportunity, using a deeply mysterious, subtle form of invisible vibration known as 'sound'. - You thought sound and hearing are well understood and not 'mysterious'? Come and let Jan Schnupp, co-director of the Oxford University Auditory Neuroscience Group and runner-up from this year's FameLab competition in Cheltenham convince you otherwise! Originally from Munich, Jan is a researcher in neurobiology at the University of Oxford. He obtained a BSc in Genetics from UCL in 1990 and a DPhil in Physiology from Oxford in 1996. 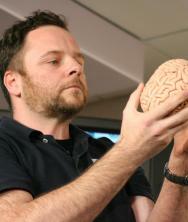 He co-directs the Oxford Auditory Neuroscience group, together with Prof Andrew King. His main research interest concerns how auditory information is represented and processed in the auditory cortex. "As a little kid, when I got into the "why?" phase and started bugging people with endless questions, I found that I got much more satisfying answers from people with a scientific education. I never "decided" I wanted to be a scientist, I just never grew out of that "why?" phase. To me, "science" is not something you do, but an attitude, one which invites you to lift the lid off things, look at things from different angles, dig a little deeper, engage not just your eyes and your analytical mind, but also your imagination.